After less than two years with NBC5, weekday early morning co-anchor Mark Hayes is no longer with the Fort Worth-based station. His biography already has been scrubbed from the station’s website. Vice president of programming Brian Hocker confirmed Hayes’ exit Wednesday but declined to elaborate. Hayes, who made his on-air debut with NBC5 on May 7, 2012, emailed a statement Wednesday afternoon. “After careful consideration and discussion with NBC5 management, we have mutually decided to part ways and end my tenure as co-anchor of NBC5 Today,” Hayes said. “My family and I have certainly adored being a part of the Dallas-Fort Worth community and have made some wonderful friends since our arrival. Several sources say Hayes’ departure may have been tied to an internal clash with news management on what constituted “good TV.” Sources say that early morning executive producer Tim Livingston, who joined NBC5 in January 2012, has been transferred to another position in tandem with Hayes’ departure. 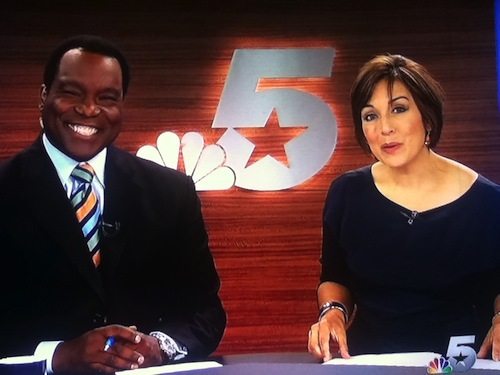 NBC5 weekend morning anchor Lindsay Wilcox took Hayes’ place on Tuesday’s waker upper and also co-anchored with longtime co-anchor Deborah Ferguson on Wednesday’s edition. Hayes joined NBC5 from WAGA-TV in Atlanta after 10 years as that station’s weekday early morning anchor. In the November “sweeps” ratings period, NBC5 ran a close third behind WFAA8 in the 6 to 7 a.m. Nielsen ratings, with Fox4 remaining a dominant No. 1. NBC5 has lost two other reporters in recent weeks. Omar Villafranca left the station this month to become the Dallas-based correspondent for CBS Newspath. Keaton Fox, who worked the early morning shift with Hayes, departed late last year and now is a weekend anchor and weekend reporter for Oklahoma City’s Fox affiliate, KOKH-TV.